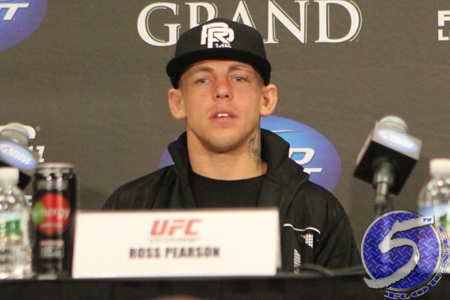 Ross Pearson (Pictured) might currently be serving as one of Dominick Cruz’s assistant coaches on “The Ultimate Fighter: Live,” but that certainly isn’t stopping the featherweight from accepting a scrap against Cub Swanson. The 145-pounders will collide June 22nd at “UFC on FX: Maynard vs. Guida.” While a specific venue hasn’t been announced for the show, Revel in Atlantic City, New Jersey is expected to host the festivities. Pearson was last seen taking a unanimous decision victory over Junior Assuncao at UFC 141. The December contest marked “The Real Deal’s” featherweight debut after moving from the lightweight class. Swanson is looking to build off his vicious TKO of George Roop at “UFC on FOX 2” in January. The veteran has alternated between wins and losses over his past seven contests. Swanson hasn’t collected two consecutive victories since December of 2008.